It is thought these are related to these Spains. born 1847 or 1848, High Sheriff of Limerick. He was living William St, Limerick, at mar, listed as "draper". 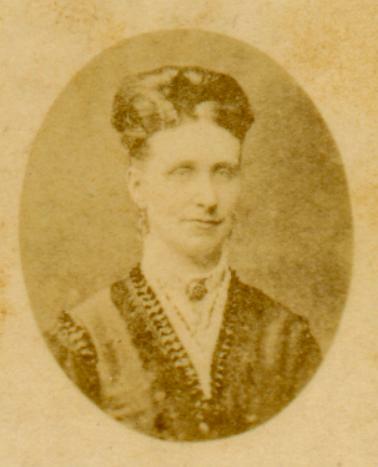 He mar 1875 to Kate Lynch [Catherine, bapt 22 July 1848]. 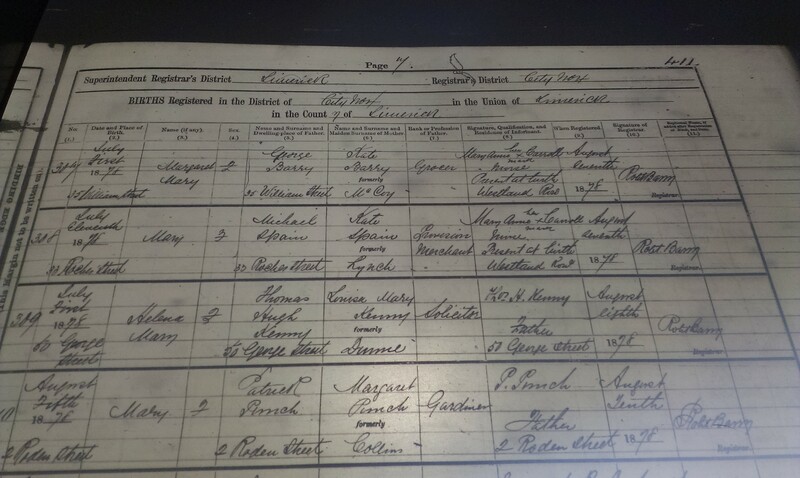 He is listed as draper, Roches St, Limerick, at son's birth 1877. They are listed as living 33 Roches St, Limerick (the Lynch house) at dau Mary's birth 1878, he is "provision merchant". He is listed as Vice-President of Shannon Rowing Club in [Bassett's, 1880] and [Bassett's, 1884]. His son was born "33 Reeves' Path" (must be mis-reading of 33 Roches St), Limerick, in 1881. He is listed as "Provision Merchant". He reported her father's death 1882. He is listed as living 45 Roches St, Limerick. He took over running her father's business. His son was born at 45 Roches St in 1883. He is "Provision Merchant". 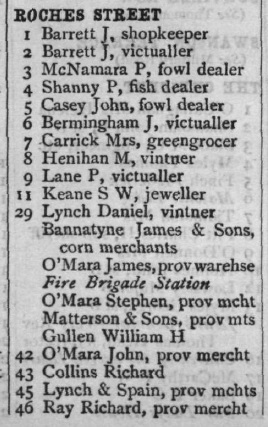 "Lynch and Spain" and "M. Spain", provision merchants, 45 Roches St, Limerick, listed in [Bassett's, 1884] (and here) and [Guy's, 1886]. Listed as "provision merchant", 45 Roches St, at son's death 1884. He is listed as living 43 Thomas St in [Bassett's, 1884], and [Guy's, 1886]. He is listed as president of Shannon Rowing Club in [Guy's, 1886]. Michael is listed as Town Councillor, Shannon ward, Limerick Corporation, in [Guy's, 1886] and up to at least [Thoms, 1898]. His son was born at 45 Roches St in 1888. He is "Provision Merchant". His son was born at 45 Roches St in 1890. He is "Provision Merchant". 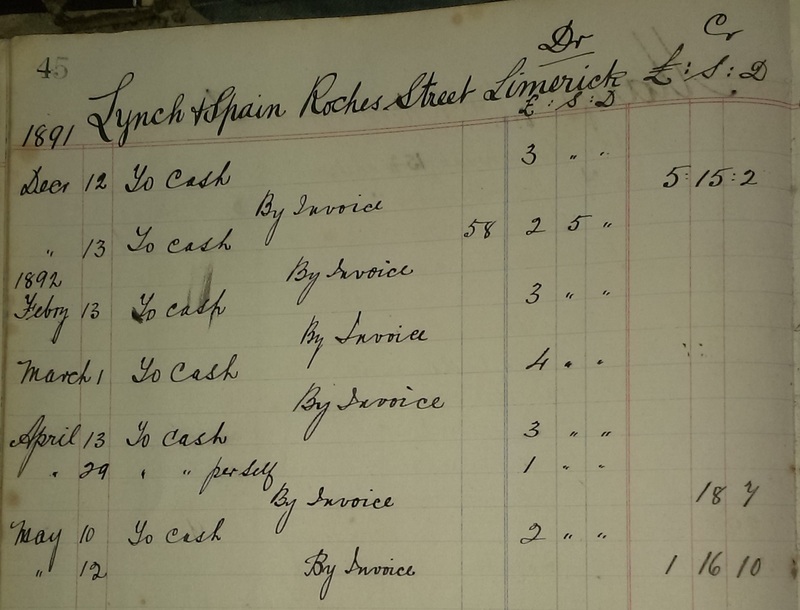 "Lynch and Spain", provision merchants, 44 Roches St, listed in [Ashe's, 1891]. High Sheriff of Limerick city 1893: He was High Sheriff of Limerick City for 1893. He is listed as High Sheriff of Limerick, and T.C. (Town Councillor) for Shannon Ward, living Hartstonge St, in [Thoms, 1893]. He was at Jim O'Mara's funeral 1893. His death report says he was in the provision business, and was a large employer. He was involved in sporting life (racing, rowing, athletics, cycling). He owned several race horses, including "Carmelia" and "Eveline". He is listed as T.C. in Limerick Chronicle article, 6 Oct 1896. A truncated article in Limerick Chronicle, 23rd July 1898, shows him at Regatta Dinner. Listed as T.C. (todo) See full article. Listed as T.C. for Shannon Ward, Limerick, in [Thoms, 1898]. He was living Crescent View, Military Rd, Limerick, at death. At death he is listed as "bacon merchant". At death and wife's death and dau's marriage he is listed as "B.C." (would be "Borough Councillor"). He died at his home, Crescent View, Limerick, Thur night, 6 Dec 1900, of "congestion of liver" [GROI], age 52 or 53. See report of death in Limerick Chronicle, 8 Dec 1900. Votes of condolence passed by Limerick Corporation, and by the nationalist National League. Funeral in Limerick, Sun 9 Dec 1900. Huge attendance, including Mayor of Limerick, Thomas Cleeve, High Sheriff of Limerick, Michael Joyce, MP, many local politicians, and many people from Nenagh. 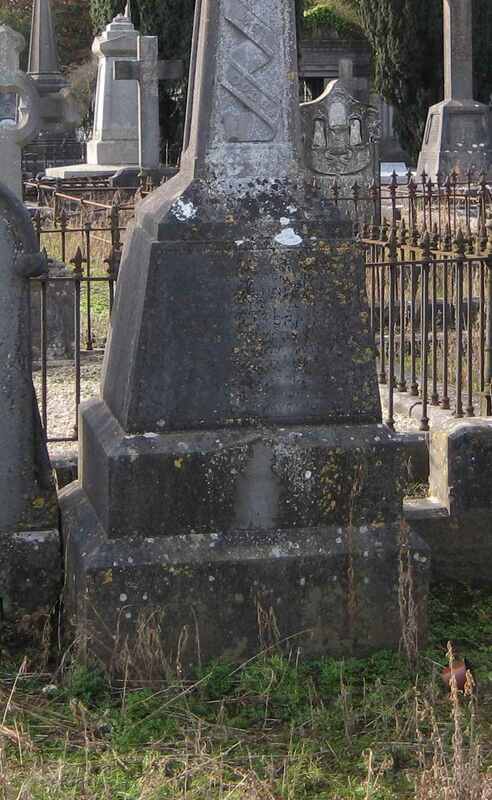 He was bur in Spain grave at Mount St. Lawrence cemetery, Limerick. See funeral report in Limerick Chronicle, 11 Dec 1900. (todo) See full report. In [P106/33] Kate on 15 Dec 1900 thanks Mrs and Miss Rahilly for their sympathy. Kate died 8 Apr 1901 [grave],[death notice], age 52 yrs, at 90 Harcourt St, Dublin. 90 Harcourt St is listed in [Thom's, 1901] as Wellington House Private Home Hospital. Death not found in [GROI]. See death notice in Irish Times, April 9, 1901. Funeral 10 Apr 1901. Attendance included Mayor of Limerick, Thomas Cleeve, Michael Joyce, MP, and James F. Barry, High Sheriff of Limerick. She was bur in Spain grave at Mount St. Lawrence cemetery, Limerick. See funeral report in Limerick Chronicle, 11th April 1901.
died 1 Oct 1884, 45 Roches St, age 7 yrs, of scarlet fever, see entry in [GROI]. mar 1901 to Jim Gaffney [born 1866] and had issue. bapt 17 Oct 1881 [St.Michael's RC church, Limerick]. He was orphaned in 1900-01. Took over family business. He is listed as "M.A. Spain", living Crescent View, Military Rd, Limerick, at father's death 1900. He is listed in [Census, 31 Mar 1901] as the 19 year old head of the household at Military Rd, Limerick. His father dead. This is only days before his mother's death in Apr 1901. His younger brothers are there but his mother is not (she would be in Dublin). He is "provision merchant". They have two domestic servants living with them. Listed as "M.C. Spain, Limerick" at grandfather's funeral, Apr 1901. He took over father's business. He sold Crescent View 1901-02. (todo) See [P106/355] which is a letter of 22 Feb 1902 from A.G. O'Keefe to Dr. David Humphreys wondering "who bought Michael Spain's house". Michael is listed as merchant, Roches St, at mar 1909.
to Kathleen O'Donnell [born 1884 or 1885, Limerick city, dau of Bryan	O'Donnell, merchant]. See mar entry in [GROI]. See her family listed in 1901 census at Ballyclough, S of Limerick city (see map). She is listed as of William St, Limerick, at mar. Michael and Kathleen are listed in [Census, 1911] as living 6 Alexandra Terrace, Military Rd, Limerick (near Crescent View which now has the Morony family in it). He is bacon merchant. They have 1 servant, no children. "Michael Spain" (the business) is listed at 39-40 Roches Street in [Guy's, 1912]. "Michael Spain" listed as living 6 Alexandra Terrace, O'Connell Avenue, Limerick, in [Guy's, 1912] to [Guy's, 1914]. "Lynch and Spain", bacon merchants, and bacon curers, and provision merchants, and "Provision Importers (American)", 40 Roches St, are listed in [Guy's, 1912] to [Guy's, 1914], and [Cork & Munster, 1915] to [Cork & Munster, 1920]. M. Spain, Provision Merchants, Roches St, listed in [Cork & Munster, 1915] to [Cork & Munster, 1920]. he wit his brother's mar 1909.
living Limerick 1901, at home in 1901 census. age 10 when orphaned in April 1901. One or more of the sons was educ Crescent College, Limerick. born 4 September 1865 in Moanfin. 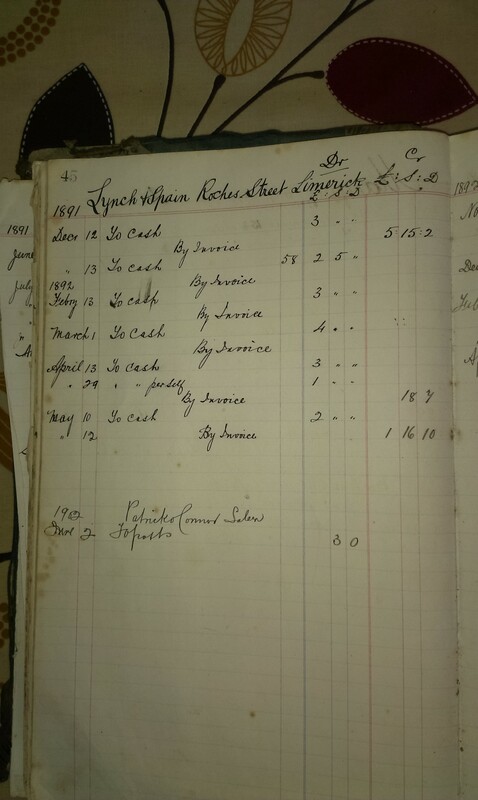 Lynch and Spain in 1891-92 in the ledger books of Tim O'Connor of Tarbert Island. Lynch and Spain, and O'Mara's bacon factory and Richard Ray's shop, on Roches St, Limerick, listed in [Guy's, 1893]. 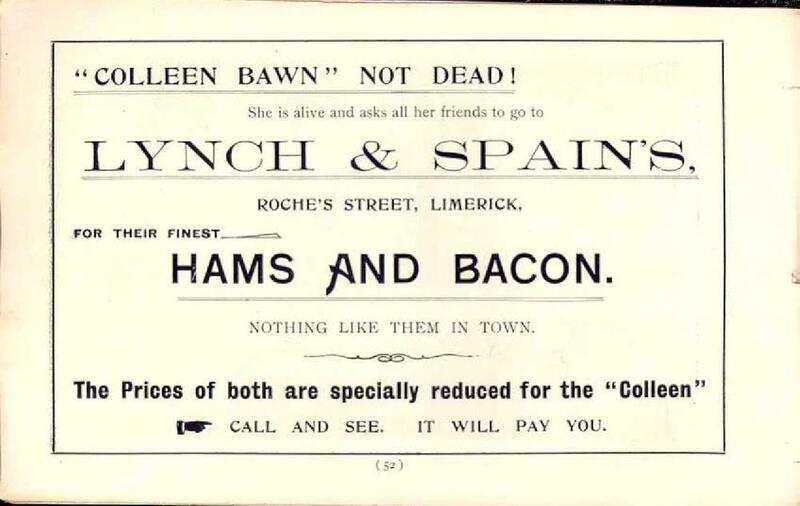 Ad of 1903 for Lynch and Spain, provision merchants, of Roches St (now being run by young Michael Spain). From "Colleen Bawn" Fete in aid of St.John's Hospital, Limerick, June 8th to 13th, 1903. Limerick City Museum. Close-up of Lynch / Spain / O'Mara grave. Mount St. Lawrence cemetery, Limerick. Photo 2009. See full size.